An F-117 Nighthawk stealth strike aircraft flying over Nevada in August 2002. Stealth aircraft are designed to avoid detection using a variety of advanced technologies that reduce reflection/emission of radar, infrared, visible light, radio-frequency (RF) spectrum, and audio, collectively known as stealth technology. Development of stealth technology likely began in Germany during World War II, the planned Horten Ho 229 being described as the first stealth aircraft. Well-known modern examples of stealth of U.S aircraft include the United States' F-117 Nighthawk (1981–2008), the B-2 Spirit, the F-22 Raptor, and the F-35 Lightning II. While no aircraft is totally invisible to radar, stealth aircraft make it difficult for conventional radar to detect or track the aircraft effectively, increasing the odds of a successful attack. Stealth is the combination of passive low observable (LO) features and active emitters such as Low Probability of Intercept Radars, radios and laser designators. These are usually combined with active defenses such as chaff, flares, and ECM. It is accomplished by using a complex design philosophy to reduce the ability of an opponent's sensors to detect, track, or attack the stealth aircraft. This philosophy also takes into account the heat, sound, and other emissions of the aircraft as these can also be used to locate it. During the First World War, an attempt to reduce the visibility of military aircraft through the experimental use of "Cellon" plastic transparent covering material resulted in single examples of the Fokker E.III Eindecker fighter monoplane, the Albatros C.I two-seat observation biplane, and one German heavy bomber design, the Linke-Hofmann R.I all being covered with the "Cellon" material; the latter two aircraft had all-wooden structures covered with the "Cellon" material, which degraded rapidly in direct sunlight and were not proceeded with any further. Nearly three decades later, a more serious attempt at "invisibility" was tried with the Horten Ho 229 flying wing fighter-bomber, developed in Germany during the last years of World War II. In addition to the aircraft's shape, which may not have been a deliberate attempt to affect radar deflection, the majority of the Ho 229's wooden skin was bonded together using carbon-impregnated plywood resins designed with the purported intention of absorbing radar waves. Testing performed in early 2009 by the Northrop-Grumman Corporation established that this compound, along with the aircraft's shape, would have rendered the Ho 229 virtually invisible to the top-end HF-band, 20-30 MHz primary signals of Britain's Chain Home early warning radar, provided the aircraft was traveling at high speed (approximately 550 mph (890 km/h)) at extremely low altitude (50–100 feet). In the closing weeks of WWII the US military initiated "Operation Paperclip", an effort by the US Army to capture as much advanced German weapons research as possible, and also to deny that research to advancing Soviet troops. A Horten glider and the nearly complete Ho 229 V3 third prototype airframe were secured and sent to Northrop Aviation for evaluation in the United States, who much later used a flying wing design for the B-2 stealth bomber. During WWII Northrop had been commissioned to develop a large wing-only long-range bomber (XB-35) based on photographs of the Horten's record-setting glider from the 1930s, but their initial designs suffered controllability issues that were not resolved until after the war. Northrop's small one-man prototype (N9M-B) and a Horten wing-only glider are located in the Chino Air Museum in Southern California. Modern stealth aircraft first became possible when Denys Overholser, a mathematician working for Lockheed Aircraft during the 1970s, adopted a mathematical model developed by Petr Ufimtsev, a Russian scientist, to develop a computer program called Echo 1. Echo made it possible to predict the radar signature an aircraft made with flat panels, called facets. In 1975, engineers at Lockheed Skunk Works found that an aircraft made with faceted surfaces could have a very low radar signature because the surfaces would radiate almost all of the radar energy away from the receiver. Lockheed built a model called "the Hopeless Diamond", so-called because it resembled a squat diamond, and looked too hopeless to ever fly. Because advanced computers were available to control the flight of even a Hopeless Diamond, for the first time designers realized that it might be possible to make an aircraft that was virtually invisible to radar. The first combat use of purpose-designed stealth aircraft was in December 1989 during Operation Just Cause in Panama. On 20 December 1989, two USAF F-117s bombed a Panamanian Defense Force barracks in Rio Hato, Panama. In 1991, F-117s were tasked with attacking the most heavily fortified targets in Iraq in the opening phase of Operation Desert Storm and were the only jets allowed to operate inside Baghdad's city limits. Early stealth aircraft were designed with a focus on minimal radar cross section (RCS) rather than aerodynamic performance. Highly-stealth aircraft like the F-117 Nighthawk are aerodynamically unstable in all three axes and require constant flight corrections from a fly-by-wire (FBW) flight system to maintain controlled flight. Most modern non-stealth fighter aircraft are unstable on one or two axes only. However, in the pursuit of increased maneuverability, most 4th and 5th-generation fighter aircraft are designed with some degree of inherent instability that must be controlled by fly-by-wire computers. As for the B-2 Spirit, based on the development of the flying wing aircraft by Jack Northrop since 1940, design allowed creating stable aircraft with sufficient yaw control, even without vertical surfaces such as rudders. Earlier stealth aircraft (such as the F-117 and B-2) lack afterburners, because the hot exhaust would increase their infrared footprint, and breaking the sound barrier would produce an obvious sonic boom, as well as surface heating of the aircraft skin which also increased the infrared footprint. As a result their performance in air combat maneuvering required in a dogfight would never match that of a dedicated fighter aircraft. This was unimportant in the case of these two aircraft since both were designed to be bombers. More recent design techniques allow for stealthy designs such as the F-22 without compromising aerodynamic performance. 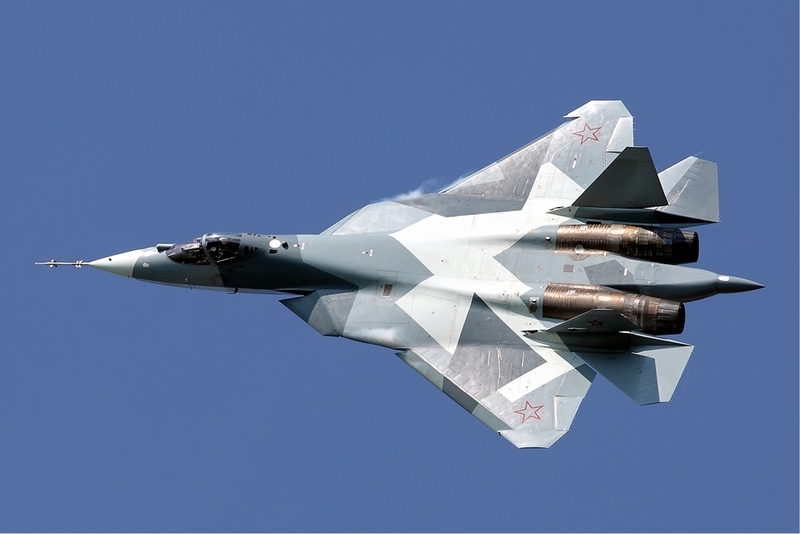 Newer stealth aircraft, like the F-22, F-35 and the Sukhoi T-50, have performance characteristics that meet or exceed those of current front-line jet fighters due to advances in other technologies such as flight control systems, engines, airframe construction and materials. This vulnerability is addressed by operating in a manner that reduces the risk and consequences of temporary acquisition. The B-2's operational altitude imposes a flight time for defensive weapons that makes it virtually impossible to engage the aircraft during its weapons deployment. New stealth aircraft designs such as the F-22 and F-35 can open their bays, release munitions and return to stealthy flight in less than a second. Also, such aircraft as the F-22 Raptor and F-35 Lightning II Joint Strike Fighter can also carry additional weapons and fuel on hardpoints below their wings. When operating in this mode the planes will not be nearly as stealthy, as the hardpoints and the weapons mounted on those hardpoints will show up on radar systems. This option therefore represents a trade off between stealth or range and payload. External stores allow those aircraft to attack more targets further away, but will not allow for stealth during that mission as compared to a shorter range mission flying on just internal fuel and using only the more limited space of the internal weapon bays for armaments. Stealth aircraft often have skins made with Radar-absorbent materials or RAMs. Some of these contain Carbon black particles, some contain tiny iron spheres. There are many materials used in RAMs, and some are classified, particularly the materials that specific aircraft use. Passive (multistatic) radar, bistatic radar and especially multistatic radar systems detect some stealth aircraft better than conventional monostatic radars, since first-generation stealth technology (such as the F117) reflects energy away from the transmitter's line of sight, effectively increasing the radar cross section (RCS) in other directions, which the passive radars monitor. Such a system typically uses either low frequency broadcast TV and FM radio signals (at which frequencies controlling the aircraft's signature is more difficult). Later stealth approaches do not rely on controlling the specular reflections of radar energy and so the geometrical benefits are unlikely to be significant. In December 2007, SAAB researchers revealed details for a system called Associative Aperture Synthesis Radar (AASR) that would employ a large array of inexpensive and redundant transmitters and a few intelligent receivers to exploit forward scatter to detect low observable targets. The system was originally designed to detect stealthy cruise missiles and should be just as effective against aircraft. The large array of inexpensive transmitters provides a degree of protection against anti-radar (or anti-radiation) missiles or attacks. Schlieren-Soldering-Iron-Heat. Note that the soldering iron tip itself is not glowing because it is not Infrared photography. Had the photograph been a composite of Schlieren and infrared, the soldering iron tip would show as a source of illumination and the atmospheric disturbance caused by the heating would show as well. The infrared point of origin or target would be unambiguous. Schlieren is the German plural of schliere, which is German for the English word streak. Schlieren are visible streaks produced in a transparent medium as a result of variations in the medium's density leading to variations in refractive index. Anything that disturbs the atmosphere may be detected (Schlieren Photography) because of the Schlieren effect caused by that atmospheric disturbance. This type of Measurement and signature intelligence (MASINT) detection falls under the category of Electro-optical MASINT. A telephoto or telescopic picture of a jet passing between the photographer and a full moon will sometimes show the outline of the aircraft as well as the atmospheric distortions of the exhaust plumes. This passive principle can be used at all wavelengths of the electromagnetic spectrum. Some analysts claim Infra-red search and track systems (IRSTs) can be deployed against stealth aircraft, because any aircraft surface heats up due to air friction and with a two channel IRST is a CO2 (4.3 µm absorption maxima) detection possible, through difference comparing between the low and high channel. These analysts point to the resurgence in such systems in Russian designs in the 1980s, such as those fitted to the MiG-29 and Su-27. The latest version of the MiG-29, the MiG-35, is equipped with a new Optical Locator System that includes more advanced IRST capabilities. VHF radar systems have wavelengths comparable to aircraft feature sizes and should exhibit scattering in the resonance region rather than the optical region, allowing most stealth aircraft to be detected. This has prompted Nizhniy Novgorod Research Institute of Radio Engineering (NNIIRT) to develop VHF AESAs such as the NEBO SVU, which is capable of performing target acquisition for SAM batteries. Despite the advantages offered by VHF radar, their longer wavelengths result in poor resolution compared to comparably sized X-band radar array. As a result, these systems must be very large before they can have the resolution for an engagement radar. The Dutch company Thales Nederland, formerly known as Holland Signaal, developed a naval phased-array radar called SMART-L, which is operated at L-Band and has counter-stealth. Over-the-horizon radar is a concept increasing radar's effective range over conventional radar. The Australian JORN Jindalee Operational Radar Network can overcome certain stealth characteristics. It is claimed that the HF frequency used and the method of bouncing radar from ionosphere overcomes the stealth characteristics of the F-117A. In other words, stealth aircraft are optimized for defeating much higher-frequency radar from front-on rather than low-frequency radars from above. The stealth platforms may have slower advances in materials technology and physical limits so that further advances in stealth become either impossible or unaffordable. This may force future stealth platforms to stand off from their targets and use active countermeasures and long range weaponry to strike targets. However if the stealth aircraft are constantly upgraded they can hope to jam or evade emerging threats better than similarly equipped non-stealthy platforms could. The F-117 Nighthawk stealth attack aircraft. The People's Republic of China plans to introduce the Chengdu J-20 stealth multi-role fighter round 2018. A prototype was flown in early 2011. The first time that a stealth aircraft was shot down was on 27 March 1999, during Operation Allied Force when an American F-117 Nighthawk was brought down by an Isayev S-125 'Neva-M' missile launched by a Serbian Air Defense crew who were operating their radars on unusually long wavelengths. The pilot ejected and was rescued and the aircraft remained relatively intact due to slowly striking the ground, inverted. In December 2011, Iranian sources showed videos of a captured US RQ-170 stealth drone in a good shape with intact central controlling unit. The information was later confirmed by US sources. The analysts say that the drone might have been captured by electronic cyber attack or jamming. There are reports that China and Russia asked Iran to inspect the drone less than a week after the Iranian video was released. A B-2 crashed on 23 February 2008 shortly after takeoff from Andersen Air Force Base in Guam. The investigation stated the B-2 crashed after "heavy, lashing rains" caused water to enter skin-flush air-data sensors, which feed angle of attack and yaw data to the computerized flight-control system. The water distorted pre-flight readings in three of the plane's 24 sensors, causing the flight-control system to send an erroneous correction to the B-2 on takeoff. The B-2 quickly stalled, became unrecoverable, and crashed. The sensors measure environmental factors including air pressure and density, for data to calculate airspeed, altitude and attitude. Because of the faulty readings, the flight computers determined inaccurate airspeed readings and incorrectly indicated a downward angle for the aircraft, which contributed to an early rotation and an un-commanded 30-degree pitch up and left yaw, resulting in the stall. Horten Ho 229 – Flying wing turbojet fighter prototype test in 1944. Project cancelled in 1945 due to the worsening war situation. Tupolev Tu-160M - upgraded bomber with RCS reduction features. Messerschmitt Me 163B – rocket-powered fighter aircraft. HAL Tejas - Incorporates high degree of composites and radar absorbent material and a Y-duct inlet which shields the engine compressor face from probing radar waves. ↑ Mahulikar, S.P., Sonawane, H.R., & Rao, G.A. : (2007) "Infrared signature studies of aerospace vehicles", Progress in Aerospace Sciences, v. 43(7-8): 218-245. ↑ Rao, G.A., & Mahulikar, S.P. : (2002) "Integrated review of stealth technology and its role in airpower", Aeronautical Journal, v. 106(1066): 629-641. ↑ 3.0 3.1 3.2 Myhra, David (July 2009). "Northrop Tests Hitler's 'Stealth' Fighter". p. 11. ↑ 4.0 4.1 4.2 John Pike (2008-01-21). "Global Security.org F-22". Globalsecurity.org. http://www.globalsecurity.org/military/systems/aircraft/f-22-stealth.htm. Retrieved 2010-12-16. ↑ "FAS.org". FAS.org. http://www.fas.org/spp/aircraft/part06.htm. Retrieved 2010-12-16. ↑ Robinson, Tim. "Not so hidden dragon – China’s J-20 assessed." Aerospace Insight, 14 January 2011. ↑ "Iran to equip fighter aircraft with new stealth systems." ↑ "Centennial of Flight". Centennialofflight.gov. http://www.centennialofflight.gov/essay/Evolution_of_Technology/Stealth_aircraft/Tech31.htm. Retrieved 2010-12-16. ↑ See Rich and Janos, Skunk Works; Little Brown & Co., 1994 passim chapters 1 and 2. ↑ John Pike. "Global Security.org F-117". Globalsecurity.org. http://www.globalsecurity.org/military/systems/aircraft/f-117.htm. Retrieved 2010-12-16. ↑ Rich and Janos, Skunk Works, pgs 30-31, 46. ↑ John Pike (2001-10-26). "Global Security.org F-35". Globalsecurity.org. http://www.globalsecurity.org/military/systems/aircraft/f-35.htm. Retrieved 2010-12-16. ↑ "Raptor … or Turkey?". Defensetech.org. 2006-08-14. http://defensetech.org/2006/08/14/raptor-or-turkey-part-two/. Retrieved 2010-12-16. ↑ Weiner, Tim (1997-08-23). "The $2 Billion Stealth Bomber Can't Go Out in the Rain". The New York Times. http://query.nytimes.com/gst/fullpage.html?res=950CE1DA133EF930A1575BC0A961958260. Retrieved 2007-12-18. ↑ United States General Accounting Office (GAO) B-2 Bomber: Cost and Operational Issues (Letter Report, 08/14/97, GAO/NSIAD-97-181). ↑ "Bistatic Radar Sets". Radartutorial.eu. http://www.radartutorial.eu/05.bistatic/bs04.en.html. Retrieved 2010-12-16. ↑ "Radical and Cheap Anti-Stealth Radar". 2007-12-07. http://www.military.com/features/0,15240,157743,00.html. ↑ "Schlieren (physics)" (in English and German). Collins English Dictionary. HarperCollins Publishers. http://www.thefreedictionary.com/schlieren. Retrieved 3 June 2013. ↑ Radar, Cordless. "RAND Report Page 37". Flight International. http://www.flightglobal.com/blogs/the-dewline/2008/10/infamous-jsf-report-precedes-a.html. Retrieved 2010-12-16. ↑ "VI - STEALTH AIRCRAFT: EAGLES AMONG SPARROWS?". Federation of American Scientist. http://www.fas.org/spp/aircraft/part06.htm. Retrieved 2008-02-21. ↑ Ewing, Philip. "Did CNO just take a big swipe at F-35?" DoD Buzz, 3 July 2012. ↑ "Israel, U.S. Agree To $450 Million In F-35 EW Work." Aviation Week, 6 August 2012. ↑ "Will Stealth Survive As Sensors Improve? F-35, Jammers At Stake." ↑ Crocker 2006, p. 382. ↑ Schmitt, Eric (1991-06-17). "Navy Looks On With Envy At Air Force Stealth Display". The New York Times. http://www.nytimes.com/1991/06/17/us/navy-looks-on-with-envy-at-air-force-stealth-display.html. ↑ "Crisis in Libya: U.S. bombs Qaddafi's airfields". CBS News. 2011-03-19. Archived from the original on 2012-05-25. https://archive.is/kYk4. ↑ 34.0 34.1 Logan, Don. Lockheed F-117 Nighthawks: A Stealth Fighter Roll Call. Atglen, Pennsylvania: Schiffer Publishing, 2009. ISBN 978-0-7643-3242-5. ↑ "Iran releases video of downed U.S. spy drone–looking intact | The Envoy - Yahoo! News". News.yahoo.com. 2011-12-08. http://news.yahoo.com/blogs/envoy/iran-releases-images-downed-u-spy-drone-171144210.html. Retrieved 2012-09-29. ↑ "Officials Confirm Authenticity of Iranian TV Images Showing Lost U.S. Drone". Fox News. 8 December 2011. http://www.foxnews.com/politics/2011/12/08/iranian-tv-airs-purported-images-downed-us-drone/. ↑ "Iran displays purported US drone - Middle East". Al Jazeera English. http://www.aljazeera.com/news/middleeast/2011/12/201112818188328743.html. Retrieved 2012-09-29. ↑ Lavitt, Michael O. "B-2 Crashes on Takeoff From Guam." Aviation Week, 23 February 2008. ↑ "Moisture confused sensors in B-2 crash", AirForceTimes, 6 June 2008. ↑ Shachtman, Noah (6 June 2008). "Video: Stealth Bomber Crashes". Wired. http://blog.wired.com/defense/2008/06/video-stealth-b.html. ↑ "Air Force World: B-2 Crash Cause Identified", AIR FORCE Magazine, July 2008, Vol. 91, No.7, pp. 16-17. ↑ "Lampyridae". F-104.de. 1995-03-14. http://www.f-104.de/exponates/english/exp_lampyridae_eng.html. Retrieved 2010-12-16. ↑ "Hitler's Stealth Fighter Re-created". News.nationalgeographic.com. 2010-10-28. http://news.nationalgeographic.com/news/2009/06/090625-hitlers-stealth-fighter-plane.html. Retrieved 2010-12-16. ↑ 46.0 46.1 46.2 46.3 "Situation Awareness". Users.globalnet.co.uk. http://www.users.globalnet.co.uk/~dheb/2300/Articles/PG/PGSA.htm. Retrieved 2010-12-16. ↑ 47.0 47.1 "EADS Knows LO, Aviationweek May 23, 2007". Aviationweek.typepad.com. 2007-05-23. http://aviationweek.typepad.com/ares/2007/05/eads_knows_lo.html. Retrieved 2010-12-16. ↑ John Pike. "MiG-29 FULCRUM". Globalsecurity.org. http://www.globalsecurity.org/military/world/russia/mig-29-specs.htm. Retrieved 2010-12-16. ↑ "Tu-160 Put On Hold." ↑ Stüwe, Botho., p. 258 Das Ortungsignal der Me 163 B war relativ schwach ... difficult Radar target, absence of dihedral reflector (tailless). Peenemünde West (in German). Augsburg, Germany: Bechtermünz Verlag, 1999. ISBN 3-8289-0294-4. ↑ "'Sofreh Mahi': The Radar Evading UAV from Iran". Ias100.in. http://ias100.in/news_details.php?id=40. Retrieved 2012-09-29. ↑ "First Look At MiG Skat UCAV". Aviation Week. 2007-08-23. http://www.aviationweek.com/aw/generic/story.jsp?id=news/MIG082307.xml&headline=First%20Look%20At%20MiG%20Skat%20UCAV&channel=null. Retrieved 2010-12-16. ↑ "Photo Release - Northrop Grumman Reveals First Navy Unmanned Combat Aircraft (NYSE:NOC)". Irconnect.com. 2008-12-16. http://www.irconnect.com/noc/press/pages/news_releases.html?d=156493. Retrieved 2010-12-16. Clancy, Tom. Fighter Wing. London: HarperCollins, 1995. ISBN 0-00-255527-1CITEREFClancy1995.